Aim: To evaluate the bacteria extruded apically during root canal preparation using two hand and rotary instrumentation techniques. Materials and Methods: Eighty freshly extracted mandibular premolars were mounted in bacteria collection apparatus. Root canals were contaminated with the pure culture of Enterococcus fecalis (ATCC 29212) and dried at 37°C for 24 h. Bacteria extruded were collected, incubated in brain heart infusion agar for 24 h at 36°C and the colony forming units (CFU) were counted. Statistical Analysis: The mean number of colony forming units were calculated by One-way ANOVA and comparison between the groups made by multiple comparison (Dunnet D) test. Results: The step-back technique extruded highest number of bacteria in comparison to other hand and rotary Ni-Ti systems. Conclusion: Under the limitation of this study all hand and rotary instrumentation techniques extruded bacteria. Among all the instrumentation techniques step-back technique extruded more number of bacteria and K-3 system the least. Further in vivo research in this direction could provide more insight into the biologic factors associated and focus on bacterial species that essentially play a major role in post instrumentation flare-ups. Bacteria extruded from the root canal are mainly gram positive, gram negative, and obligate anaerobes. Enterococcus fecalis, Propionibacterium alactolyticus, Propionibacterium propionicum were found in root canal failure cases. Recently E. fecalis has been identified as a species most commonly recovered from post treatment disease. Seltzer S and Naidrof,  Tanlap J et al. studied the immunological aspects of postoperative flare-ups and concluded that antigens originating from the root canal result in the formation of antigen-antibody complex when forced beyond the apical foramen, which may lead to severe inflammatory response. Er et al. and Kustarci A et al. reported that the intracanal bacteria can be extruded apically along with debris, during instrumentation utilizing a new experimental model. Various studies have been used in the past in evaluating the apical extrusion of debris and irrigant and but very few studies are reported in the literature about bacterial extrusion using an experimental model. A total of 80 freshly extracted human mandibular premolars were used for the study. Teeth with complete root formation, having single canal and mature apical foramen , length of roots approx 21 mm, canal curvature between 0 to10°, apical diameter conforming to 15 K file were selected. Teeth were observed under stereomicroscope and digital radiographs in buccal and proximal directions to determine the presence of single canal. Test apparatus to determine apical extrusion of intracanal bacteria is shown in [Figure 1]. 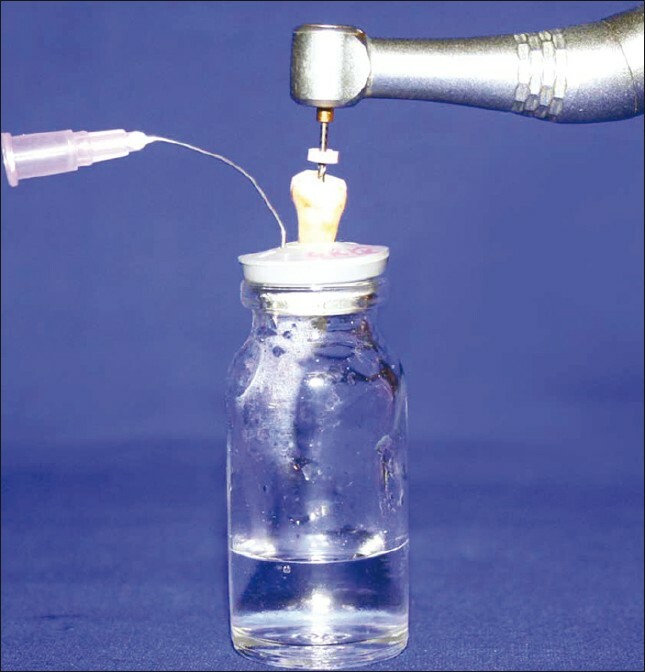 The tooth was forced through the rubber stopper of a vial after endodontic access cavity preparation. Two coats of nail varnish applied to the external surface of the root and then the tooth with the rubber stopper fitted into mouth of the vial. 23-gauge needle was inserted into the vial through the rubber stopper to equalize the air pressure. Entire apparatus was sterilized in an autoclave. Before experiment, the vial was filled with normal saline solution. The hole was created in nail varnish that covered the apical foramen using 10 K-file. In this way, the standard size foramen and apical patency was achieved. The tooth with rubber stopper needle unit was placed into the mouth of the vial. The same procedure was repeated to all experimental teeth. A pure culture of E. fecalis (ATCC 29212) was used to contaminate the root canal. Suspension was prepared by adding 1 ml of pure culture of E. fecalis grown in brain-heart infusion broth for 24 h to fresh brain-heart infusion broth. The McFarland standard number 0.5 was used to evaluate the broth to ensure that number of bacteria was 1.5 × 10 8 colony forming units (CFU) ml/l. Root canal was completely filled with the E. fecalis suspension. During incubation, canals were hand instrumented with #10 K-file to carry the bacteria down the length of the canal. The contaminated root canal was dried at 37°C for 24 h.
Single operator, using aseptic techniques, carried out the preparation and sampling procedures on each specimen under a class I laminar airflow cabinet to prevent airborne bacterial contamination. Samples were equally divided into four groups for instrumentation with different techniques. Group I - Teeth in this group were instrumented with the step-back technique. The procedure was divided into two phases: Phase I apical preparation starting at the apical constriction till #30 K-file. Phase II preparation of remainder of the canal, gradually stepping back while increasing the instrument #30 to #50. Frequent recapitulation using #10, #15, #20, and #25 K-files as larger size files are used for apical preparation. Group II - instrumentation was done with hand protaper, a set of six instruments: Three shaping files (Sx, S1, and S2) for crown down procedure and three finishing files (F1, F2, and F3) for apical shaping. Followed by frequent recapitulation with #10, #15, #20, and #25 K-files as the larger-sized files were used for apical preparation. Group III - instrumentation with the K-3 Rotary Ni-Ti Technique, canals were prepared with 0.12 taper K-3 instrument to the resistance followed by 0.10 taper and 0.08 taper instruments. Initial glide path was achieved using #10, #15, and #20 K-files. Canals were further prepared with 0.06 taper with #45 K-3 instruments to the resistance from largest instrument to smallest reaching the working length. After middle third scouting with #10 K-files #40, #35, #30 K-3 instruments were used in crown-down fashion till the working length and with frequent recapitulation #15, #20, and #25 K-files. Group IV - instrumentation with rotary protaper. After achieving a straight-line access; a smooth glide path was achieved with, #10 or #15 K-file used till two-third the working length. S1 shaping file was used and moved apically 3 mm short of working length. Sx files were than used sequentially until resistance was encountered (4-5 mm from working length) followed by S1 and S2 to working length for shaping of coronal two thirds of the canal. Using F1, F2, and F3 files sequentially to the working length finishing of apical third was done. During root canal instrumentation, 1 ml of distilled water was used after each instrument change. The rubber stopper was placed on the needle and the needle was advanced into the root canal 3 mm short of working length. The apical preparation was done till #30 K-file in all instrumentation techniques. Subsequently after root canal preparation 0.1 ml of saline was taken from experimental vial in order to count the bacteria and incubated in brain-heart infusion agar at 37°C for 24 h. Colonies of bacteria were counted using a colony counter (Yarco colony counter) following a classical bacterial counting technique as described by Collins et al. The results were given as number of CFU ml/1. Data regarding the number of bacteria extruded are presented in [Table 1]. The results indicated that all instrumentation techniques tested caused a measurable apical extrusion of bacteria. The hand instrumentation techniques (step-back and hand protaper techniques) extruded more number of bacteria compared to engine driven K-3 and rotary protaper systems. The step-back technique showed greatest extrusion of bacteria and there was a statistically significant difference (P<0.05) found between the step-back technique and other hand and rotary Ni-Ti instrumentation techniques. The K-3 system extruded significantly smaller number of bacteria. Shovelton DS,  , Seltzer and Naidorf,  and Siqueria  have reported that along with debris, the bacteria are also extruded through the apical foramen. The number of bacteria extruded apically has a direct correlation with weight of debris (quantitative factor), type, and virulence of bacteria (qualitative factor). The aim of present study was to assess the extrusion of intracanal bacteria as a result of canal shaping by different instrumentation techniques. Methodology employed in this study was similar to that described by Er et al. The amount and type of irrigant and operator is common to all the techniques. E. fecalis was chosen as the bacteriological marker because it can survive alone without symbiotic support from other bacteria. Every effort should be made to limit the periapical extrusion of intracanal material during treatment that has the potential to bring about serious systemic disease such as endocarditis, brain abscess, and septicemia, particularly in compromised patients. Further in vivo research in this direction could provide more insight into the biologic factors associated with correlations and consequences of apically extruded debris and may focus on bacterial species that essentially play a major role in post instrumentation flare-ups. Hand instrumentation techniques (step-back and hand protaper) extruded large number of bacteria than engine driven techniques (rotary protaper and K-3 system). The step-back technique extruded highest number of bacteria and among the rotary systems the K-3 system extruded least number of bacteria. 1. Seltzer S and Naidorf IJ. Flare-ups in Endodontics: I Etiological factors. J Endod 1985;11:472-8. 2. McKendry DJ. Comparison of balanced forces, endosonic, and step-back filing instrumentation techniques: Quantification of extruded apical debris. J Endod 1990;16:24-7. 3. Siqueria JF. Microbial causes of endodontic Flare ups. Int Endod J 2003;36:453-63. 4. Tanalp J, Kaptan F, Sert S, Kayahan B, Bayirl G. Quantitative evaluation of the amount of apically extruded debris using three different rotary instrumentation systems. Oral Surg Oral Med Oral Pathol Oral Radio Endod 2006;101:250-7. 5. Al-Omari MA, Dummer PM. Canal Blockage and debris extrusion with eight preparation techniques. J Endod 1995;21:154-8. 6. Er Sumer K, Akpinar KE. Apical extrusion of intracanal bacteria following use of two engine driven instrumentation techniques. Int Endod J 2005;38:871-6. 7. Kustarci A, Akpinar KE, Kursat. Apical extrusion of intracanal debris and irrigant following use of various instrumentation techniques. Oral Surg Oral Med Oral Pathol 2008;105:257-62. 8. Collin's CH, Lyne PM, Grange JM. Counting methods. In: Collins CH, Lyne PM, Grange GM, editors. Collins' and Lyne's microbiological methods. 9. Reddy S, Hicks L. Apical extrusion of debris using two hand and two rotary instrumentation techniques. J Endod 1998;24:180-3. 10. Gutierrez JH, Brizuela C, Villota E. Human teeth with periapical pathosis after over instrumentation and overfilling of the canals: A scanning electron microscopic study. Int Endod J 1999;32:40-8. 11. Shovelton DS. The presence and distribution of microorganisms within non vital teeth. Br Dent J 1964;117:101-7. 12. Sequria JF, Rocas IN, Favieria A. Incidence of post-operative pain after intra canal procedures based on an antimicrobial strategy. J Endod 2004;28:457-60. 13. Naidorf IJ. Endodontic flare-ups: Bacteriological immunological mechanisms. J Endod 1985;11:462-4. 14. McCary BR, Streckfuss JL, Kene HJ. Oral hygiene and prevalence of oral group D streptococci in medically physically compromised and periodontal disease patients. J Periodo 1989;60:255-8. 15. Perrini N, Fonzi L. Mast cells in human periapical lesions: Ultrastructural aspects and their possible physiopathological implications. J Endod 1985;11:197-202. 16. Hubard R, Gutmann JL, Wagner MJ. Quantitative assessment of canal debris forced periapically during root canal instrumentation using two different techniques. J Endod 1987;13:554-8. 17. Mounce R. The K3 rotary nickel-titanium file system. Dent Clin North Am 2004;48:137-57. 18. Elmsallati EA, Wadachi R, Suda H. Extrusion of debris after use of rotary nickel-titanium files with different pitch: A pilot study. Aust Endod J 2009;35:65-9. Garlapati, R. and Venigalla, B.S. and Patil, J.D. and Raju, R.V.S.C. and Rammohan, C.